Protect your rights and maximize your payout after a New Hampshire car accident. We answer key questions and show you how to build a strong insurance claim. Car accidents happen when you least expect it, no matter how carefully you drive. One minute you’re driving along, minding your own business, and the next minute you’re reeling from the impact of a collision. After a car accident, you’ll want to be fairly compensated for your injuries and property damages. Financial recovery from accident losses starts with building a strong insurance claim. You can’t avoid every accident, but you can be prepared to build a strong insurance claim by knowing what to do and say, and the pitfalls to avoid after a car accident. Here are 11 steps to building a successful auto insurance claim, with answers to the most frequently asked questions after an accident. Will the police respond to the accident? Does the officer have to listen to what I have to say? What if a police officer gives me a ticket? What other evidence do I need? What is a Notification clause? When do I contact the other driver’s insurance company? When do I have to report the accident? How can I find the New Hampshire DMV office nearest to me? What are my options against an at-fault driver? 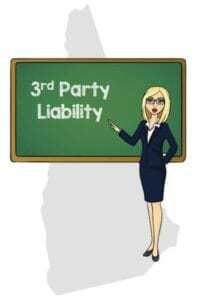 What are the mandatory liability limits in New Hampshire? What about Medical Payment Insurance? 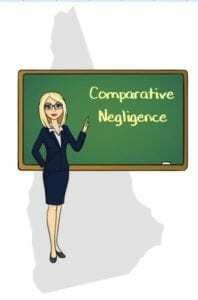 What does comparative negligence mean to me? 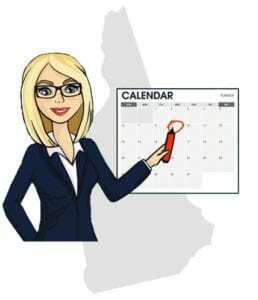 Where can I learn more about New Hampshire small claims court? What is New Hampshire’s Statute of Limitations? What if the insurance company won’t return my calls? If you’ve been in a New Hampshire car accident, stop as close to the accident scene as you safely can. Check to see if anyone is hurt and call 911. Do what you can to help the injured until EMS arrives. As soon as is practical, you must exchange information with the other driver. 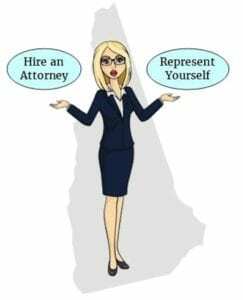 Under New Hampshire law, you must provide your name and address, driver’s license number, vehicle registration, and the names of your passengers. The 911 dispatcher will need details about your location, any injuries, and what’s going on around you. Be specific about your location. Tell the dispatcher the name of the road you’re on, the direction you were heading, and the nearest intersections. Describe any nearby landmarks. Tell the dispatcher if anyone is injured, pinned in their car, or complaining of feeling sick. The dispatcher needs to know if there are any specific hazards near the scene like downed power lines, leaking fuel, blocked traffic, fires, or overturned vehicles. Tell the dispatcher about anything you think may be dangerous. Police will typically be dispatched to an accident with injuries, reported hazards, or where traffic management is needed. In busy jurisdictions, there may not be an officer available to respond to parking lot accidents or minor fender-benders. Your injuries may be obvious, like broken bones or deep lacerations. But some injuries are not so easy to see. You may be in shock from the collision. Some serious, even life-threatening injuries like internal bleeding or traumatic brain injuries may not become obvious until hours or even days after the accident. Never refuse medical treatment at the accident scene. This is not the time to be stoic. If emergency responders want to take you to the hospital, go with them. If you aren’t transported directly to the hospital from the accident scene, be sure to have a medical evaluation as soon as possible. See your personal medical provider or go to the nearest urgent care center or hospital emergency department. Don’t wait. Failing to seek immediate medical treatment after an auto accident is an invitation to the insurance company to contend your injuries had nothing to do with the crash. Law enforcement officers are highly trained in car accident investigation. When the police respond to an accident, they are authorized to secure the scene, work with other emergency responders to care for the injured, gather information from the people involved, and more. You can try to tell your side of the story, but the officer investigating the accident is not required to hear you out. When the police give you instructions or ask for your identification or car information, you must cooperate. Failure to obey a police officer after a car accident in New Hampshire can result in penalties ranging from a monetary fine to a felony conviction. 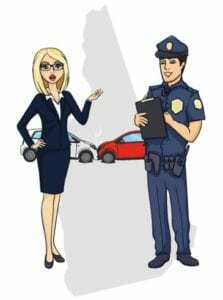 If the investigating officer determines you’ve violated any New Hampshire traffic laws, you may be issued one or more citations. You can try to talk the officer out of giving you a ticket, but once the citation is issued, you should accept it and sign your name, if requested. Accepting a traffic ticket is not an admission of guilt. You can argue the merits of the citation in traffic court, not at the accident scene. If you’re the victim of an accident caused by a negligent driver, you’ll need proof the other driver did something wrong or failed to drive responsibly. The evidence you gather immediately after the accident will not only support your insurance claim, but it can also help refute accusations made against you by the other driver. Property damages include your vehicle repair bills, rental car costs while your car is being repaired, the cost of personal items damaged in the accident, and the value of your car if it’s a total loss. Bodily injury damages can include your medical and mental health treatment bills, costs for medications and assistive devices, therapy bills, replacement services, the cost of transportation for treatment, and pain and suffering. The photographs you take and videos you record can make compelling evidence in support of your accident claim. Pictures and videos might reveal important details of the wrecked cars, the surrounding area, and can catch actions of the other driver and passengers that may show intoxication or other behavior that has a bearing on the situation. Use your cell phone, camera, or any other device at hand to take as many photos and videos as you can, from different angles of the accident scene. The images you take after an accident can make it very hard for the other driver and passengers to change their stories later on. While witnesses are under no obligation to speak with you, try to find out if they saw anything that will help your claim. If you have a willing witness, ask them to write down their contact information and a description of what they saw, and ask them to sign and date their written statement. Get the make, model, year, license plate number, expiration date, and vehicle identification number (VIN) from the other car. The VIN can normally be found on the left side of the dashboard, where it meets the windshield. You may also find the VIN on the driver’s insurance card, or inside the door jamb of the driver’s side door. You’ll need permission to enter the other driver’s vehicle. Gather information on the other passengers. Ask for their full names, dates of birth, addresses, telephone numbers, e-mail addresses, and any other contact information. They may not be cooperative, but that can’t stop you from making detailed notes about the passengers, including their appearance, apparent injuries, and behavior. Draw a diagram of the accident scene, showing the position of the cars, the direction they were heading, and any unusual road conditions, like ice, potholes, or gravel. Make notes about the date and time of the crash, the weather, the lighting conditions, and anything else that may have been a factor in causing the crash. You’ll always be prepared with this free Car Accident Information Form. Keep a copy of the form and a pen in your car, in the same place as your proof of insurance, for a handy way to gather important evidence after an accident. If you start reading the long version of your insurance policy, you’ll probably find a Notice of Occurrence and Cooperation clause. Your insurance policy is a contractual agreement between you and the company. You’ve agreed to notify your insurer of an accident, even if no one is hurt, or the other driver takes the blame and wants to “take care of it” without involving the insurance companies or law enforcement. You bought insurance to protect you after an accident, but you must do your part. No matter the circumstances of a collision, you are better off by notifying your insurance company. If the other driver decides to blame you for the crash, or anyone from the other car starts to complain of injury symptoms or hires an attorney, they will certainly be contacting your insurance company with demands for money. Your insurer would be at a serious disadvantage if you hadn’t already reported the accident. By failing to notify your insurance company of an accident, you risk causing the company to raise your premiums, decline to renew your policy, or even cancel your insurance. After you’ve notified your own insurance company, you’ll need to put the at-fault driver’s insurance company on notice of your claim. If you’ve been badly injured, you can consult with a personal injury attorney to decide if you should have your attorney handle your damage claims with the insurance company. If you are not represented by counsel, you may contact the at-fault driver’s insurance company directly to file your claim. Be careful, as anything you say can be used against you in their negotiations and valuation of your claim. Keep a record of every communication you have with the insurance company, including the date and time, who you dealt with, and what was discussed. After your claim is filed, if you aren’t satisfied with the negotiations, or you aren’t comfortable being questioned by the adjuster, you can still consult with an attorney. Once you have an attorney, you won’t have to deal directly with the insurance company. Below are just a few of the available free apps. Check with your insurance company to see if they offer a similar application. 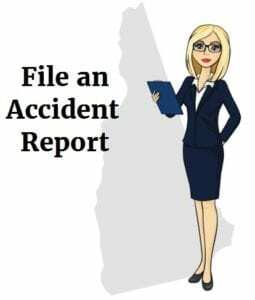 In New Hampshire, drivers involved in a car accident resulting in death, personal injuries, or property damage totaling more than $1,000, must report the accident in writing to the New Hampshire Department of Motor Vehicles within 15 days, unless the accident was investigated by police. If the police have investigated, the police report will satisfy the requirements. To report an accident that was not investigated by police, complete and submit Form DSMV 400. To find the office closest to you, visit the New Hampshire DMV Offices page. When you file a claim against the at-fault driver’s insurance policy, you are making a third-party claim. When you file a claim with your own insurance company, it’s a first-party claim. 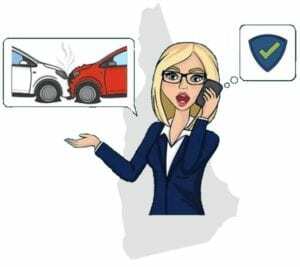 New Hampshire is not a no-fault insurance state, where drivers are forced by law to rely on their own insurance to pay for car accident property damage and injuries. Therefore, if you’re involved in a New Hampshire car accident, you are free to file a third-party claim against the at-fault driver. Auto insurance policies in New Hampshire are required to have bodily injury liability coverage amounts of at least $25,000 per person and $50,000 per accident, and at least $25,000 in liability coverage for property damage. Your policy’s liability coverage will pay for damages to others caused by an accident that was your fault. 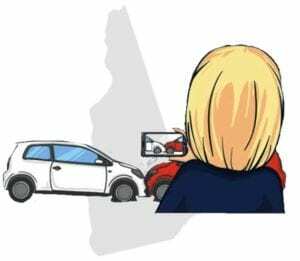 New Hampshire is one of the very few states that does not require drivers to carry auto insurance. However, if you own a car and elect not to purchase insurance, you are supposed to have enough money set aside to cover the mandated liability limits to prove your financial responsibility. Proof of financial responsibility is required if you are involved in an accident, get more than one speeding ticket, or any of several other situations arise. If you do not have insurance, you will lose your driver’s license, vehicle registrations and vehicle plates, until you come up with the money to deposit funds with the state treasurer equal to the minimum liability coverage limits. 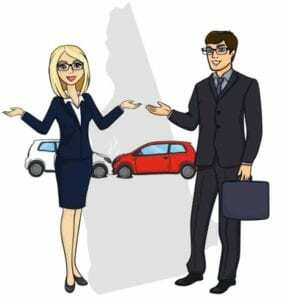 Car insurance policies in New Hampshire must include medical payment coverage of at least $1,000 per person. Your policy’s medical payment coverage, or “MedPay,” may be used to pay accident-related medical expenses for you and your passengers, regardless of who caused the accident. New Hampshire law requires auto insurance policies to include uninsured motorist bodily injury coverage in amounts equal to the liability coverage on the policy. In other words, your policy must have uninsured motorist bodily injury coverage of at least $25,000 per person and $50,000 per accident. Uninsured motorist coverage kicks in if you are involved in an accident with an at-fault driver who does not have insurance in force at the time of the crash. 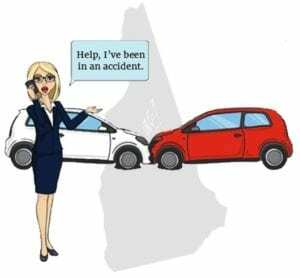 When it comes to New Hampshire car accidents, comparative negligence means you can seek compensation from the other driver or their insurance company even if you are partly to blame for the accident, so long as you are not more to blame than the other driver. You can be up to 50% at fault and still get paid, but the amount will be reduced in proportion to your share of blame for the accident. After a New Hampshire car accident, your first experience with comparative negligence rules will likely be from the insurance company, if they tell you they won’t pay the full amount you requested because you contributed to causing the accident. You may need to go to court to dispute the insurance company’s decision or to dispute how much blame for the accident is yours. Ashley was heading to work in the right lane of the interstate. Lee was also in the right lane, traveling behind her. Lee wanted to pass Ashley, so he moved into the center lane and increased his speed. Once he thought he had passed her, Lee started moving back into the right lane. Unfortunately, when Lee moved back into the right lane, his car hit the front of Ashley’s car, causing her car to run off the road into a tree, severely injuring Ashley. Ashley filed a personal injury claim with Lee’s insurance company, demanding $100,000 for her medical bills and pain and suffering. The insurance company denied Ashley’s claim, decided that Ashley was liable for the accident because she sped up when Lee was trying to pass her. Through her attorney, Ashley filed a lawsuit against Lee. During trial, the jury learned that after the crash Lee was cited by police for moving into the right lane before it was clear for passing. The jury also heard witness testimony that Ashley increased her speed when Lee was trying to pass her. The jury determined that Lee was 80% at fault for the accident, for moving back into the right lane before it was clear. But Lee wasn’t the only negligent driver. The jury decided that if Ashley hadn’t sped up, Lee might not have hit her at all. While the jury agreed that Ashley’s claim was worth $100,000, they found that she was 20% to blame for the crash for speeding up to keep Lee from passing her. Based on New Hampshire’s comparative negligence rule, Ashley was awarded $80,000, representing a 20% reduction to her insurance settlement. If the jury had determined Ashley to be 51% or more at fault for the accident, she would have left the courtroom with nothing. There are some injury claims which can be successfully resolved without legal representation. However, other claims require an experienced personal injury attorney to obtain an adequate settlement. Before you decide to go it alone against the insurance company, think about the kind of injuries you’ve suffered and what it will take to get the insurance company to pay a fair amount for your losses. “Soft tissue” injuries include scrapes and bruises, strains and soreness, whiplash, and other minor injuries. Soft tissue claims can often be settled without the help of an attorney. Claims for soft tissue injuries aren’t complicated and are usually a total of your costs for medical treatment, physical therapy, some lost wages, and a limited amount for pain and suffering. “Hard” injuries are a completely different story. Hard injuries include severe lacerations, open fractures, amputations, extensive burns, and potentially life-threatening or disabling injuries like spinal cord damage and head trauma. Hard injuries result in high-dollar claims that include the cost of expensive diagnostics, hospitalizations, surgery, specialized medical care, rehab, replacement services and a tremendous amount of pain and suffering. Getting the insurance company to fully compensate you for serious injuries will entail the use of sophisticated legal tactics, like sworn medical testimony, records subpoenas, actuarial analysis, and more. The insurance company will do whatever it takes to protect its bottom line, and that means avoiding large payouts to claimants like you. You can’t trust the claims adjuster to look after your best interests. They know once they make their “final offer,” you probably won’t have the skills or energy to fight them. They’re counting on it. That’s why insurance companies routinely offer much lower settlements to accident victims who aren’t represented by counsel. An experienced personal injury attorney will help protect your financial future with the tools and the talent needed to compel the insurance company to pay the amount you deserve for your serious injuries. Your first consultation with a personal injury attorney is usually free, and you can meet with more than one attorney before selecting who will represent you. Before your first meeting with an attorney, put together an accident file. Your file will include all your accident-related documents. Helpful paperwork can include a copy of the police report, your medical records and bills, witness statements, photographs and videos, and documentation of any communications you’ve had with the insurance company. After listening to your story and reviewing your accident file, the attorney will tell you the approximate value of your case, how long it could take to settle, and if a lawsuit will be necessary. Your attorney won’t have to be paid up front. Most personal injury attorneys represent car accident victims on a contingency fee basis, meaning the attorney won’t be paid unless you receive a financial settlement or court award. Attorney fees generally range from 25% up to 40% of your gross settlement or award, depending on the complexity of your case. If the attorney can’t settle your claim or loses your case in court, you won’t owe any fees. You may file a claim in New Hampshire small claims court to recover damages up to $10,000. Claims over $5,000 are subject to mandatory mediation to encourage you to settle your case. If your claim is for more than $1,500, the defendant has the right to ask for a jury trial. If a jury trial is requested, the case will automatically be moved out of small claims court to the Superior Court. Your lawsuit will be filed against the negligent driver, not the driver’s insurance company. 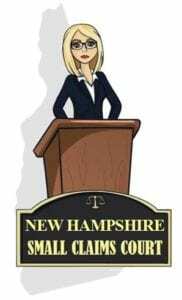 Visit the Judicial Branch website for or more information on New Hampshire small claims court filings. A statute of limitations is the legislative deadline for starting a legal action for recovery of damages against the party responsible for your losses. New Hampshire’s Statute of Limitations for auto accident claims is three (3) years. The statute begins to run on the crash date. 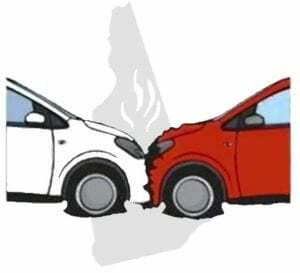 You must either settle your claim or file a lawsuit against the at-fault driver within three years from the date of the accident, or your claim will be extinguished. The insurance company is under no obligation to settle your claim before the statute of limitations expires. Don’t be led to believe their claims adjuster will help you reach a fair settlement before the deadline. The insurance company knows what happens if your claim isn’t settled and you haven’t filed a lawsuit against their insured before the statute runs out. It’s up to you to know the statute of limitations deadline for your accident claim. Unless you have a fully executed settlement agreement in your hands, you must file a lawsuit against the at-fault driver before the statutory deadline, or you’ll never see a dime from the negligent driver or the driver’s insurance company, no matter how severely you’re injured. If settlement negotiations are dragging, or your filing deadline is only months away, get moving. Don’t be afraid to file a lawsuit against the person who caused your losses. Your action will not only stop the clock from running on your claim, but you’ll also be sending a clear message to the insurance company that they need to get serious about settling. After suit is filed, your attorney will continue negotiating with the insurance company and may be able to reach an equitable settlement before going to court. Be diligent. Know the statute of limitations deadline for your accident. Put reminders on your phone, your desk, and anywhere that will give you an early reminder to take action to protect your claim.